Source: Dwi Handayani, a best friend, ex roommate as well as ex colleague. 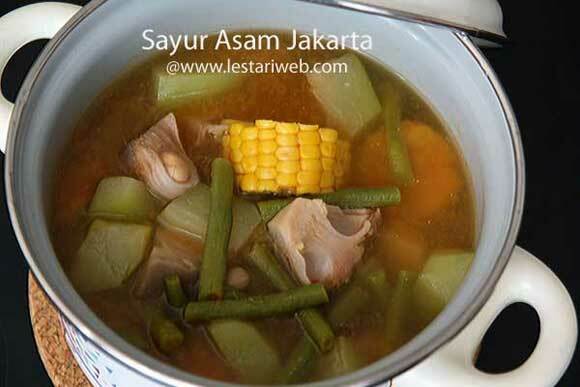 There are varieties of Indonesian Tamarind Soup, a famous variant among them is "Sayur Asem Jakarta or Tamarind Soup ala Jakarta". Originated in Jakarta, the capital city of Indonesia, now this dish is well known across the country. The specialty of this soup is using candlenuts as one of the paste ingredients. So don't worry if the soup doesn't look so clear as other varieties ( For example: Javanese or Sundanese Tamarind Soup). Infact this difference which make it special and unique! Compare to western countries where soups are likely served during the winter, in Indonesia you can find them almost any time at any weather. So please don't be surprised that during your visit in Indonesia, you're served with a kind of hot soup in a real hot day ;-) Usually Tamarind soup will be served with rice and fried fish/chicken, raw salad plus sambal. Hmmmm...yummy ;-) Thx and credits goes to Yani who's shared this recipe few years back when I was still working in Batam. I really treasure the old days when we have shared and exchanged our knowledges of Indonesian cuisine across different region and custom. 1 Blend all ingredients for the paste in a blender or food processor until smooth. (If necessery add a little bit water to help the blending process). 2 Pour in 1.5 liter water in a deep saucepan, add the paste, galangale and salam leaves. Bring the whole thing to boil over the medium heat. 3 Add the vegetables, start with the hardest one first : corn, jackfruit and peanut. 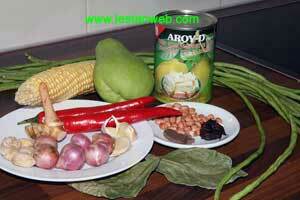 4 Add the chayote, long bean and tamarind and continue cooking until the vegetables becomes tender but not overcooked. 5 Adjust the seasoning, add salt and sugar until it tastes sweet and sour. 6 At last add melinjo leaves (if any). Remove from the heat to prevent overcooked. What an awesome way to exaplin this-now I know everything! vielen dank für dieses ausführliche und leckere rezept!